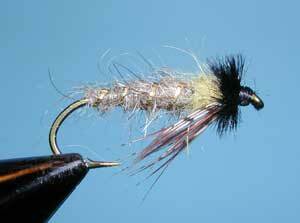 Notes: This Emerger pattern was developed by George Anderson on the Yellowstone River. George was owner of Anderson's Yellowstone Angler Fly Shop. The pattern was developed to imitate the Brachycentrus or Mother's Day Caddis. 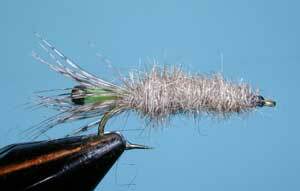 This caddis constructs a case made up of vegetative matter which is usually square at one end and tapers down. Trout will eat the entire case. There are times when the trout will feed on these caddis exclusively. Most are found in moving water and need to be weighted to get them down on the bottom. Allow the fly to tumble along the streambed . The pattern has a good contrast between the case and the body (thorax). You will find that the legs are often tied as a down beard not quite reaching the point of the hook. Originally, George tied the legs as a collar. 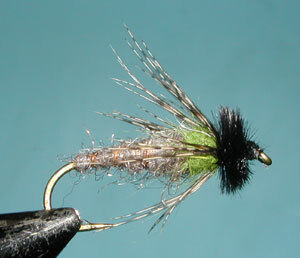 Weighting this fly is important as the actual caddis will drift with it's head pointed towards the bottom. 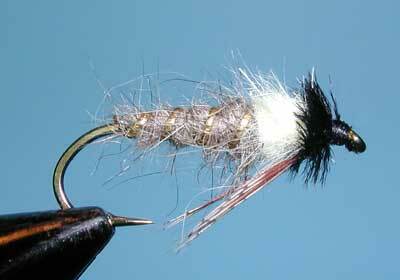 The Peeping Caddis is unique pattern developed by Carl Richards and Bob Braendle tying in a reverse method where the head and legs of the pupa emerger are over the curve of the hook. Often the peeping head is made with vernille but Yellow or Green Antron yarn will also work. The head is made by burning the end of the material.